But it's not just about discounts! We wanted to make a surprise for our users, thus we decided to give away "Back to school" sets to 10 random users with active AdGuard keys. 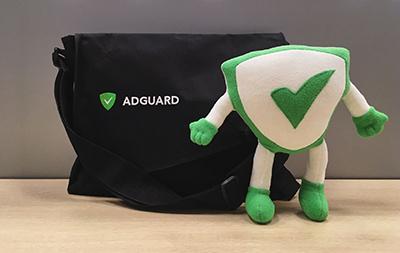 A couple of nice souvenirs from AdGuard. Any user with a purchased and active (at the promotion end) AdGuard license key can participate. Please, don't enter expired keys, keys that you haven't purchased (bonus or beta licenses), keys to other programs or a random set of characters; don't fill in the form several times with the same key – such entries won't be allowed to participate in the giveaway. In order to participate, fill in the fields in this registration form. Important: we do not share data with third parties; all the information received through the registration form will be used by AdGuard Software Limited solely for the purpose of conducting the giveaway.